Siglufjörður: an idyllically quiet fishing village in Northern Iceland, where no one locks their doors - accessible only via a small mountain tunnel. When a young woman is found lying half-naked in the snow, bleeding and unconscious, and a highly esteemed, elderly writer falls to his death in the local theatre, Ari is dragged straight into the heart of a community where he can trust no one, and secrets and lies are a way of life. An avalanche and unremitting snowstorms close the mountain pass, and the 24-hour darkness threatens to push Ari over the edge, as curtains begin to twitch, and his investigation becomes increasingly complex, chilling and personal. Past plays tag with the present and the claustrophobic tension mounts, while Ari is thrust ever deeper into his own darkness - blinded by snow, and with a killer on the loose. I've been following Orenda Books on Twitter for quite some time and it's always great to see the excitement caused by the release of a new book. I thought at one point that Snowblind was going to break Twitter as there were so many tweets about it. So I listened to my learned fellow book bloggers and headed straight over to Amazon to secure a copy for my kindle. 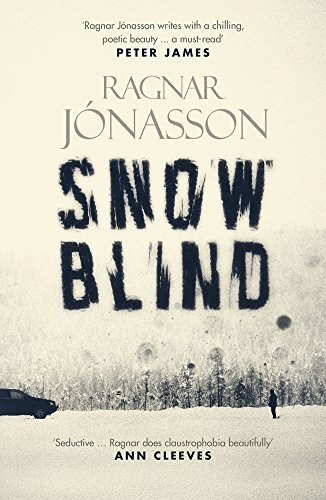 I even have to admit that at the time I purchased Snowblind, I didn't even have a kindle so what a good excuse to buy one! Ari Thór accepts a job offer which results in him moving North on his own, leaving behind his girlfriend. His girlfriend doesn't seem that upset, to be honest; she seems colder than the snow up north. When he arrives in Siglufjörður he's told that it's a quiet village and nothing ever happens there, so there's no need to even lock doors at night. Then a famous author, now part of the dramatic society at the local theare, falls to his death. Was it an accident or was he pushed? It's Siglufjörður, so surely he just fell down the stairs...at least that's what the police think until Ari Thór disturbs an intruder in his house one night and a young woman is found bleeding to death in the snow. Things have certainly started happening in quiet peaceful Siglufjörður. Has the snow brought this madness or are there some underlying secrets just bursting to be revealed? Snowblind is so very atmospheric that I had to put an extra warm layer of clothes on just to read it. I felt as if Ari Thór was the only normal person in the village and all of the villagers had hidden agendas. They do all have secrets to some degree, which is no mean feat in a town where everybody knows everybody's business. I found the snow to be a perfect setting, it almost absorbed all of the background noise giving the story a good pace without it being too busy and over-worked. Even though it's a bit of a creepy village, I'm really looking forward to visiting Siglufjörður again in Nightblind. 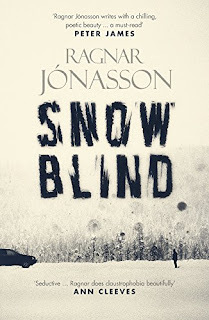 I've also got to mention an excellent idea that Ragnar Jónasson has now introduced to me through reading Snowblind. Ari Thór has a Christmas tradition of receiving a new book as a gift on Christmas Eve and reading it late into the night. I'm definitely adopting this tradition and have already marked out the perfect book - I think it's only right that it's an Orenda book so click here if you want to see what I've chosen.